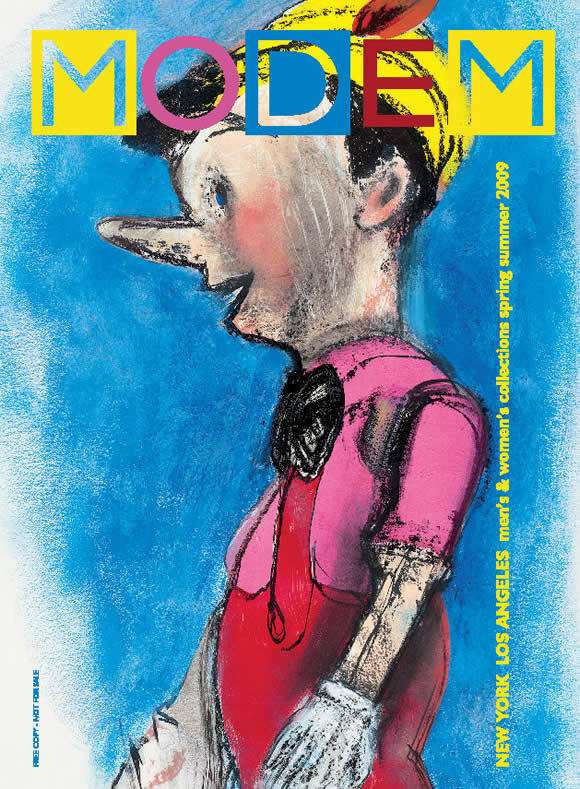 For the cover of this edition dedicated to Men’s Collections Spring-Summer 2009, we gave “carte blanche” to the American artist Jim Dine. Born in 1935 in Cincinnati, Ohio (Usa), Jim Dine has been part of the Pop-Art movement since 1960. “Thanks to Carlo Collodi, I have been able to live through this wooden boy for many years. That has been in me since I was six, like a landscape.Sixty-four years, it is a long time to know someone, but the depth of its personality and its secrets are so big”. Jim Dine works are now part of the acquisitions of the most important museums in the world: The Art Institute of Chicago; Hirshhorn Museum and Sculpture Garden & National Gallery of Art, Washington; Louisiana Museum of Modern Art, Humelbeak, Denmark; The Museum of Modern Art & Solomon R. Guggenheim Museum & The Metropolitan Museum of Art, New York; Musée National d’Art Moderne & Georges Pompidou, Paris; Museum of Fine Arts, Boston; Stedelijk Museum, Amsterdam; Tate Gallery, London.